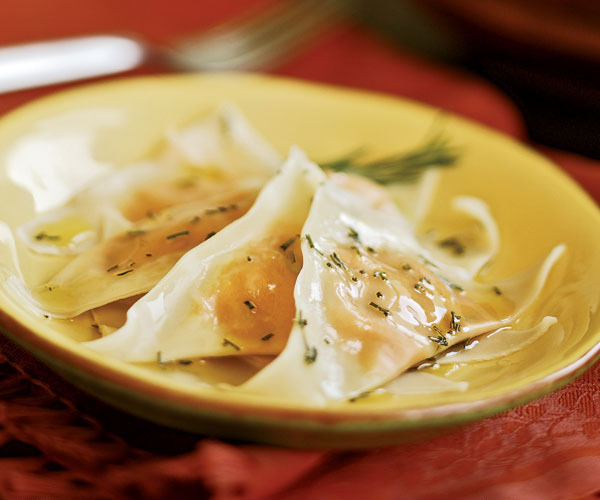 Wonton wrappers make these plump, perfect for fall ravioli a cinch to prepare, and the dish works well for a family meal or a casual supper with friends. Put the squash, 2/3 cup water, 1 Tbs. of the oil, and a scant 1/2 tsp. salt in a large, deep sauté pan. Turn the heat to high until the water simmers; cover and steam the squash until it’s just tender and the water has just evaporated, 5 to 6 minutes; check often. Stir in the garlic and 1/2 tsp. of the rosemary; sauté until fragrant, about 1 minute. Transfer to a food processor and add the cream, Parmigiano, and a few grinds pepper. Process, scraping the bowl as needed, until the mixture is mostly smooth. While the squash cools slightly, wash the sauté pan and fill it with 2 qt. water and 1 Tbs. salt; bring to a simmer over medium-high heat. With a large wire rack and a small bowl of water close by, lay six wonton wrappers on a clean, dry countertop. Drop a rounded 1 tsp. of the filling in the center of each wrapper. Brush the edges of each wrapper with a little water. Fold each wrapper to create a triangle or half moon, pushing out any air bubbles and pressing the edges to seal completely. 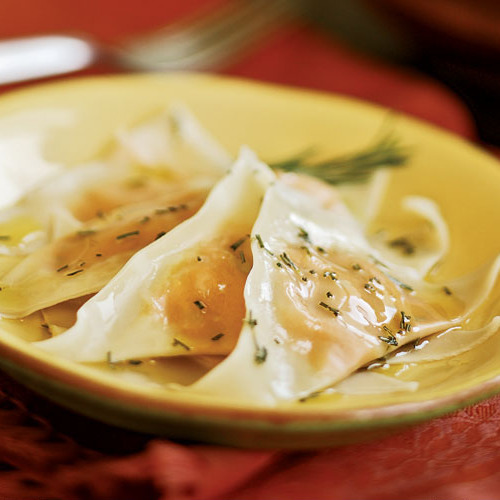 Transfer the ravioli to the wire rack; repeat the process with the remaining wonton wrappers and filling, making sure the countertop is dry after each batch. Heat the remaining 3 Tbs. oil and 1 tsp. rosemary in a small skillet or saucepan over medium heat. When the rosemary starts to sizzle, take the pan off the heat. Drop half of the ravioli into the simmering water. Cook until the wrapper over the filling starts to wrinkle and the ravioli turn translucent, 3 to 4 minutes. With a large slotted spoon, transfer six ravioli to each of three pasta plates. Repeat to cook the remaining ravioli. Drizzle each portion of the ravioli with 2 tsp. of the pasta cooking water and 1 tsp. of the rosemary oil, sprinkle with a little Parmigiano, and serve immediately. Some people may have found this too "labour intensive" but, compared to making pasta from scratch, this is a walk in the park. I liked the idea of the Wonton wrappers but didn't have any squash so used the method with a different filling.This was excellent, and I would make it again, even if I didn't have the remains of the Wonton in my freezer :-) Next time I will make it with the squash filling.